Theological systems come and go. Mostly, there are some central insights that don’t really fit into the milieu from which the new system arises, and then people try to push those insights out into the corners. The result is a new theological system. Often, that initial crucial insight is good — a breath of fresh air, a kiss on the lips, water in the desert. Usually, some of the derivative insights that arise in the early days of the system are also good. But the system as a whole has some blind spots and a few problems. As time goes on, these get developed and magnified rather than reduced, and the whole thing gets stale. Meanwhile, the Church at large is internalizing those crucial initial insights without necessarily converting to the system (“Well, I don’t agree with those guys on everything, but they’ve got a point about xyz”). Alternately, the Church converts to the system, internalizes its key aspects, and then de-converts without losing those crucial insights in the process. It’s important to realize that this dynamic wouldn’t happen without the formation of a system. The core insight is not usually obvious to people in the beginning. It conflicts with the existing system at a number of points. That insight has to be elaborated in some detail and its implications worked out before people are willing to accept it. System-building provides that work of elaboration. However, there comes a point where the system has had the impact it’s going to have, the Body has absorbed its benefits, and it’s time to move on. The system has reached its expiration date; as a system of thought, it has outlived its usefulness. Its purpose, in the end, was to serve as a vehicle through which the Body could come to grips with a few crucial truths. That work done, the members of the Body now regard those truths as self-evident, and the delivery vehicle can fall to the wayside. There’s no need to keep the old wineskin after you’ve drunk the wine. One of the signs that a system has reached its expiration date is that people will deny the system while holding to its key insights as self-evident. In extreme cases, people are totally unaware that the “self-evident biblical truths” they are affirming only came to be considered self-evident because the system they so despise made people aware of them. For example, missional types who regard the Trinity as the central biblical teaching for human relationships, but can’t say the word “Christendom” without sneering — they have somehow forgotten that Christendom furnished the historical conversation that resulted in the “self-evident” doctrine of the Trinity. The Calvary Chapel movement furnishes another useful contemporary example. Where else can you find pre-mil, pre-trib theology that holds to a firm distinction between the Church and Israel — and so abominates dispensationalism as a divisive and damaging doctrine that they actually ban discussion of dispensationalism in a home Bible study? Ugly stuff happens along these fault lines. I know of a situation where a Calvary Chapel-connected school was offered three faculty members — a Bible/theology teacher, an OT/Hebrew teacher, and a NT/Greek teacher — all three capable, all three offering skills and teaching far beyond anything the school had in its existing program. The doctrinal statement wasn’t a problem. The financial arrangements weren’t a problem. Then somebody allowed as how all three teachers hailed from a dispensational background, and that was the end. Not “Uh, guys, listen, can we talk about that?” No deal, no discussion, nope, sorry, never gonna happen. The school spooked and ran, and never looked back. In fact someone tried to oust the president of the school simply because there’d even been a thought of working with dispensationalists. Sad. The students could have developed whole skill sets that school couldn’t and can’t deliver, but the administration they were trusting to deliver a good education couldn’t see past a word. On the other hand, did it serve anyone well for the three teachers to use that word? Was the term “dispensationalism” really necessary — or even helpful? I’m not sure it is. Dispensationalism is so diluted and diverse now that it’s necessary to heap adjectives upon it in order to have any hope of describing an actual position — “progressive” and “classic” are the favorites, but they don’t help much. There’s substantial difference among “classic” dispensationalists — four dispensations, seven dispensations, etc. — and even more among the folks who take the “progressive” label. When a student balks at learning a laundry list of theological terms, we tell him that it’s necessary in order to help the conversation along. Having labels for things helps us to understand each other so that we can have good discussions. Certainly worked out that way, didn’t it? So it is that people who try to have a dispensational take on everything are about as helpful as those who try to have a Reformed take on everything — both systems, in their respective times, were a kiss on the lips, manna from heaven, good and godly work highlighting key aspects of Christian truth that were in danger of being forgotten. Glory to God for them both. Both systems, as systems, have now passed their expiration date. In the end, they were not timeless systems of thought, but simply delivery vehicles for a few key insights. The work is done; the Great Conversation has moved on. Not everyone has accepted those few key insights, but they have been rendered difficult to forget: a Roman Catholic divinity student might ignore Hus, but he’s going to have a hard time avoiding the Reformation. Moreover, a great many of the reforms called for by the Protestants (e.g., moral reform of the clergy) did take place in the Counter-Reformation, because the moral purity of the Protestant churches put the Roman church to shame. So the Reformation had its impact even on the Roman church which supposedly rejected it. Dispensationalism likewise: today you can hear people who were never dispensational talking about how a certain biblical event took place “at a different point in the story” than where we are today, and you have to take that into account. Hmmm…. Christ is building His Church, and He is using all these different movements and theologies to do it. The gates of Hades have not prevailed, and will not. And what Christ is building is His Church, not some sect or movement or particular theological system. Christ’s blessing rests on these subsets of the Church for a time, as a means to edifying the whole Church. Working in such a subset is good, honorable work, but it helps to keep in mind that you only see part of the picture. Whatever strand of the Tradition you’re part of, whatever theological system you subscribe to, remember this lesson. 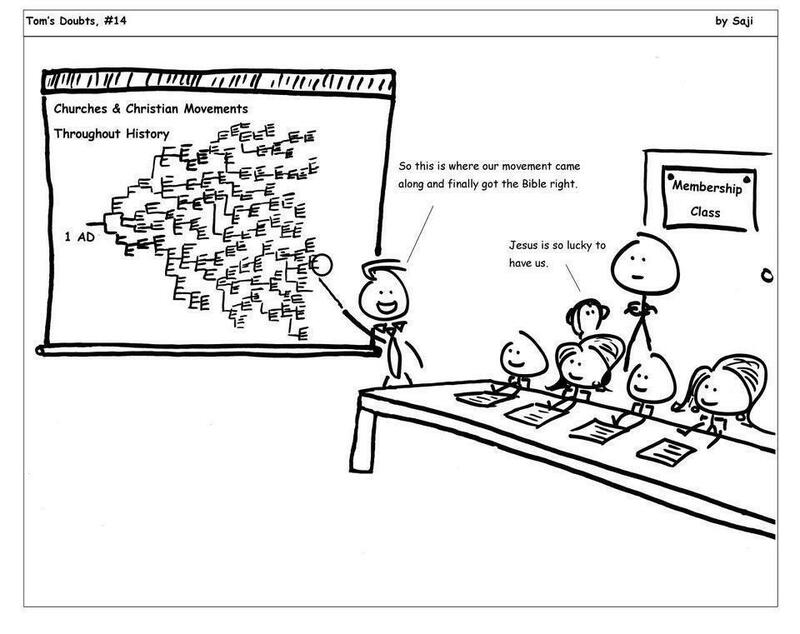 Cartoon used by gracious permission from Pastor Saji of St. Thomas the Doubter Church, Dallas, TX. For a different take on the temporary nature of theological systems and creeds, see Jim Jordan’s Symbolism: A Manifesto (particularly the last 3 pages). This entry was posted on Sunday, May 27th, 2012 at 1:00 am and is filed under Ecclesiology, Meditations, The Tradition. You can follow any responses to this entry through the RSS 2.0 feed. Both comments and pings are currently closed. Tim, I especially love the cartoon you found! It’s so funny and yet sad at the same time. The saddest part is that it fairly well represents my thinking not too many years ago. Anyway, the main reason I’m posting here is this: I’d be interested to know your thoughts on how you feel the Free Grace system fits into your “expiration date” model. Thanks for always challenging my thinking. Glad you like the cartoon, and I’m right there with you — that was me not too long ago also. In one sense, I’d say FG never really got to the point where it could have an expiration date. In order to fit the paradigm, the system has to command a pretty wide attention, and a lot of people have to buy it, at least for a time. In the great FG-LS war for the mind of American evangelicalism, FG lost, badly. We didn’t get out-argued, for all the good it did us, but we got out-preached, out-published, out-conferenced, out-commentaried, and some variety of soft-LS confusion remains the order of the day for conservative evangelicals. On the other hand, insofar as the paradigm applies, there are some interesting things happening. While Neo-Calvinism is on the rise amongst young up-and-coming pastors and theologians, there’s another current of thought that’s giving it a run for its money. Championed by the likes of Dallas Willard, Brendan Manning, the whole TrueFaced crowd, and so on, it’s the notion that God is a loving Father. Now, I’m sure some FG panickmeister could manage to turn up a quote or four to prove these gents are not FG at all, but here’s the thing: I know a LOT of people from that circle of influence who believe that because God is a loving Father, of course He won’t take your salvation away if you sin one too many times, and of course He won’t let you think you’re saved and then, if you sin too much, let you find out on judgment day that you were never His kid to start with. Loving fathers don’t do that, so God won’t do that, end of discussion. Sound FG to you? These folks have no contact with FG circles at all, that I’ve been able to discern — a bunch of ’em haven’t even read Ryrie, let alone any of the other authors, and yet they have the core of the FG message. (And to my eye, TrueFaced is the best book on FG sanctification out there, and it’s not a FG book.) This whole crowd got there by a different road, and a much more readily accessible one, since spiritual formation programs are popping up like toadstools. To me, about the worst-case scenario for the FG camp is that it descends into the censorious little ghetto that it shows signs of becoming, and is relegated to the position that the last century’s partial-rapture guys are in vis-a-vis the doctrine of rewards. (Case you don’t know, they were the only ones who did any work on the subject, so pretty much all the exegetical and theological work on rewards that’s any older than 40 years or so comes from them.) In that case, FG as we know it will not have a seat at the table in 21st-century theology, but the news is not all bad, because it will be in a lot of footnotes on specific passages and specific key doctrines like rewards and repentance. In other words, a Gen Z theologian will probably become essentially FG through his spiritual formation program as a result of coming to know God as his loving Father, and then as he’s grappling with “problem passages” for his new understanding, he discovers this treasure trove of elegant exegetical work by guys he’s never heard of like Zane Hodges and John Niemela, and a large body of theological work by Bob Wilkin and others, and what began as a deeply held but fairly fuzzy relational conviction now can draw on a lot of exegetical and theological rigor from FG work. That’s not too bad, and if that’s as far as FG gets, we should all still be profoundly grateful for all the fine work that went into it. It’ll get put to use, bit by bit, and while a couple generations down no one will know about FG as a position except a handful of scholars, the conclusions will still be around, which was always the real goal anyhow — and like I say, I figure that’s the worst-case scenario. In that case, FG is pretty much at its expiration date now as a theological system. But in truth, I really don’t think that’s the case. There’s still a lot of good work to do on rewards, and the intersection between FG and Kingdom theology (as in Reitman’s Gospel in 3D) provides some fruitful insights. I think FG will need to be willing to serve some agenda larger than itself, and stop being the Guardian of Punctilious Correctness if it’s really going to progress, but I see signs that could happen. Most of the folks my generation and younger are spectacularly uninterested in being part of a little huddle that spends all its time running around correcting people — so those of us who are FG are mostly out there taking it to the streets on our own. Most of my FG friends my own age aren’t affiliated with any FG organization at all, and most of the ones who maintain a nominal affiliation aren’t active in the organizations. To the folks who think the movement is coextensive with an organization, this is a sign that FG is dying. But grassroots involvement, practical partnerships and a willingness to serve the local community you’re in — these things aren’t precursors to death; they’re signs of life, and they bring fresh vigor to a movement. It could be that what we’re seeing is not death, but an Acts 8 scattering, the seeds of explosive growth. So in truth, I think FG may have legs for some time to come. I expect we’ll have to endure some groaning from the old guard about how back in the day, no respectable FGer would have dared to mess about with all that gushy spiritual formation stuff…but I think that partnership is all but inevitable. I wonder what Jim might have to say on this — you listening, Jim? I will have to bow to Tim’s greater exposure to “FG friends” out there—my contribution over the last several years has been primarily to the local church and to theological writing unaffiliated with the more well-known FG literature or authors. I am currently a “lay” pastor on a three-man preaching rotation through the Gospel of John during 2012. We are mid-way through John 7, and none of the three of us has so much as mentioned any of the FG organizations or the main authors within the camp. We are taking a narrative theology approach to the Gospel and the FG is woven into the exposition. We are currently technologically challenged, so the recordings of these sermons have not yet been uploaded onto our website, but these will hopefully be available soon for public consumption, God willing and the creek don’t rise. Our most recent book is entitled Portraits of Righteousness: Free Grace Sanctification in Romans 5-8, again with the FG label right on the cover, but it is being published by Liberty University Press, which has no affiliation with FGT and in fact rejected the revised edition of Free Grace Soteriology because of its theological differences with the doctrine of Elmer Towns. Our argument in Portraits goes a long way toward further development of FGT in the area of sanctification and IMO supports it with enough exegesis and cross-referencing to make it a credible contribution that can’t be “labeled” with one FG stripe or another. The same review board that rejected FGS Revised Ed apparently agreed. Fancy that. Both books should be out sometime this summer or fall.